Share the excitement with your own children or grandkids or youngsters in the neighborhood! For the youngsters, their positive ham radio experience may foster an interest in getting licensed one day. For veteran radio amateurs, it’s a chance to share their love of Amateur Radio and their stations with the next generation. To attract attention call “CQ Kids Day.” The suggested exchange is name, age, location, and favorite color. There is nolimit on operating time, and stations may work each other more than once, if the operator has changed. The suggested HF frequencies are 28.350 to 28.400 MHz, 24.960 to 24.980 MHz, 21.360 to 21.400 MHz, 18.140 to 18.145 MHz, 14.270 to 14.300 MHz, 7.270 to 7.290 MHz, and 3.740 to 3.940 MHz. Repeater contacts (with permission of the repeater’s sponsor) are okay too, and satellite contacts may provide a real thrill. Be sure to observe third-party traffic restrictions when making DX contacts. All participants are encouraged to post stories and photos to the Kids Day Soapbox page and are eligible to receive a colorful certificate. You can download the free certificate, customized with the youngsters’ names, after filling out the Kids Day Survey found on the same page as the certificate generator. Alternatively, you can send a 9 × 12 SASE to Kids Day Certificate Request, ARRL, 225 Main St, Newington, CT 06111. 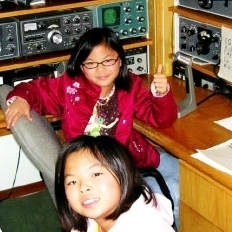 ARRL Kids Day is always the first Sunday of January and the third Saturday of June.